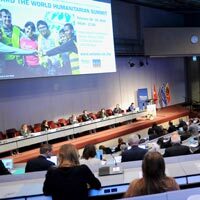 Webster University Geneva’s 23rd International Humanitarian and Security Conference drew 250 to Geneva’s U.N. district for five keynote speakers and two dozen panelists around the theme, “The Need for Effective Global Compacts on Refugees and Migration.” The annual conference was organized in cooperation with the United Nations High Commissioner for Refugees (UNHCR) and the International Committee of the Red Cross (ICRC), and benefited from the High Patronage of the Government of the Republic and Canton of Geneva. 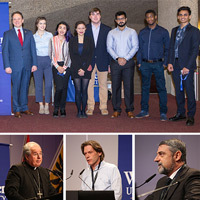 Webster University Geneva hosted its 22nd International Humanitarian and Security Conference under the theme “Upholding Refugee Protection, Human Rights and Humanitarian Law: The Role of Geneva in International Humanitarian Action." As in past editions, it benefited from the High Patronage of the Government of the Republic and Canton of Geneva. 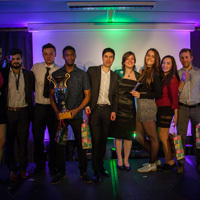 The Geneva campus was the center of Webster's Europe-based talent this in both performing arts and athletics as it hosted the annual soccer tournament and Webster's Got Talent competition. 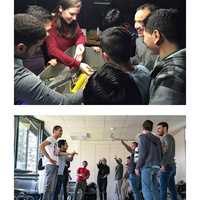 Students from Webster's Leiden, Geneva and Vienna campuses gathered April 16 for a day-evening series of contests. After the soccer (football) tourney, an all-star Webster team played against a team of young refugees and asylum seekers from Iraq, Iran and Afghanistan who regularly interact with the Webster Humanitarian Association. Students in the Webster Humanitarian Association have been holding weekly events with refugees fleeing conflict and persecution in Syria, Iraq and Afghanistan. Genthod-Bellevue, the area of Geneva where Webster's campus is located, is hosting about 50 refugees and asylum seekers from these nations. Students are interacting with the refugees through activities like film, photography, karaoke and exchanging language tips in Pashtu, Arabic, French and Farsi. 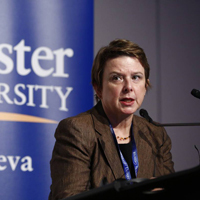 More than 350 people attended Webster Geneva's 21st annual International Humanitarian Conference, where several keynote speakers were among 40 distinguished panelists and presenters who highlighted the latest data and issues ahead of May's World Humanitarian Summit in Istanbul. The hallmark event is organized by the International Relations Department and the Webster Humanitarian Association in close cooperation with United Nations High Commissioner for Refugees (UNHCR), the International Committee of the Red Cross (ICRC) and other Webster faculty, staff and students. On Friday, Dec. 4, Webster Geneva held the third and final part of its Centennial Speaker Series: “Why Genocide? : Realities, Responses and Ramifications." This event was organized by the International Relations Department with the close collaboration and participation of the Media Communications and Psychology departments. To mark International Human Rights Day on Dec. 10 and the Human Rights Conference organized by the Webster Humanitarian Association on that day, Webster Geneva community members participated in this video about the Universal Declaration of Human Rights, the International Covenants on Human Rights. Conference speakers discussed current human rights issues from a range of perspectives, including the Global Fund and Amnesty International.